My pursuit of the world’s fanciest popcorn for fancy guesties Mom, Aissa, and Alison brought me to Clancey’s Meats and Fish in charming and trendy Linden Hills. I was looking for duck fat and truffle salt – I’d never used either ingredient before. As I waited for the butcher to scoop out a cup of rendered duck fat, I found an unmarked, 3-ounce jar of black truffle salt and handed it to the cashier. “TWENTY-FIVE DOLLARS FOR SALT!!? !” screamed the voice inside my head. I glanced back at the line of well-dressed Minneapolitans behind me, anxious to get home with their fennel pollen sausage and Alaskan sockeye salmon. “Yes. Yes, that’s fine. I’ll put it on my Visa,” I heard myself say, in an entirely unfamiliar, just-a-hair-too loud, robot voice. Thanks to my pride, I am the owner of 2.97 ounces of earthy, pungent truffle salt, and I’m happily exploring ways to use it in my cooking, tiny pinch by tiny pinch. 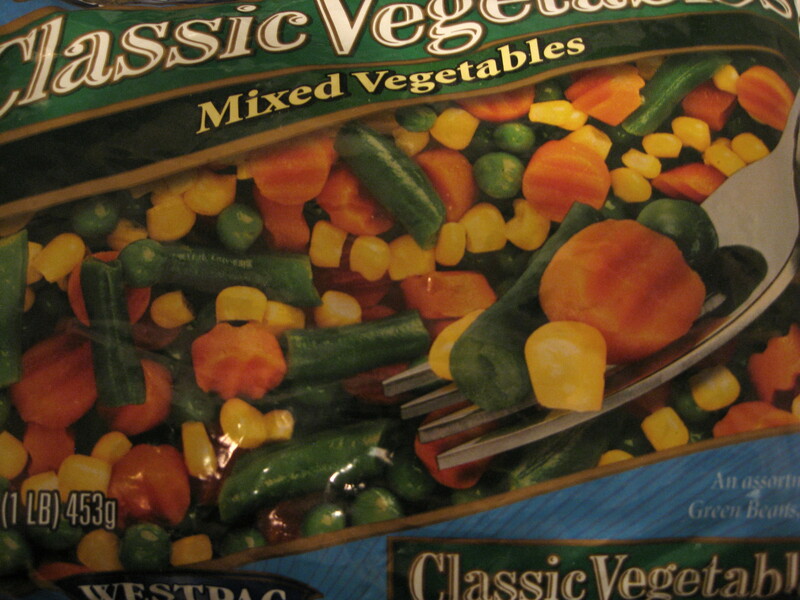 $25 salt and sale-priced frozen veggies cancel each other out, right? I substituted milk for cream in both the gravy and the potatoes; I cut half the butter in the potatoes and replaced it with a heart-healthy spread; and I used canola oil instead of butter to make a roux for the gravy. Then I added truffle salt to the potatoes, and bouillon and a lemon rind to the chicken stock to boost the flavor lost in cutting the cream and butter. It was delicious and rich – the perfect comfort food – and I didn’t miss the cream and butter at all. 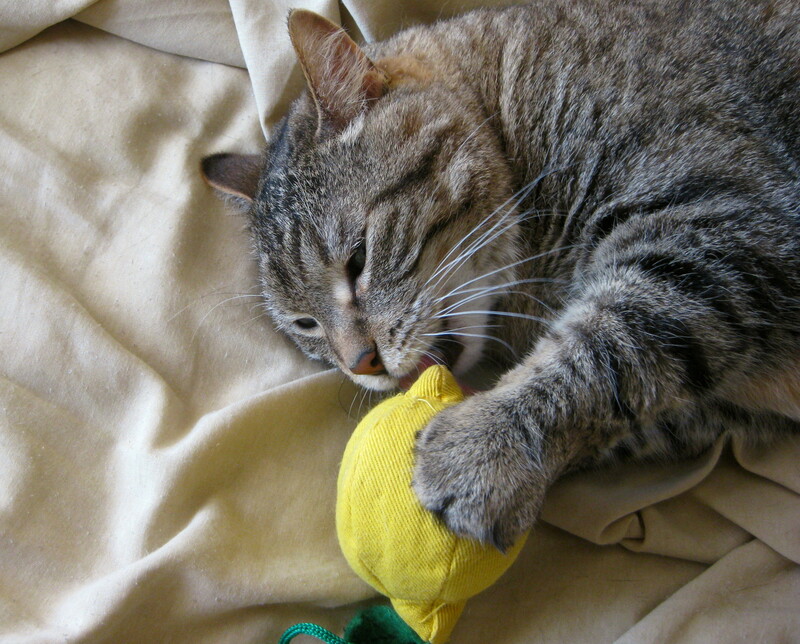 Professor Meowington sez: the lemon really brightens up the flavor of the gravy. Preheat the oven to 350°. Place the chicken thighs on a cookie sheet and brush with canola oil. Bake for 40-50 minutes, or until the chicken is cooked through. Set aside to cool. When the chicken is cool enough to touch, separate the meat from the skin and bones, shred and wrap up the meat, and refrigerate until you’re ready to add it to the soup. Freeze the skin and bones for stock. Place the potatoes in a large saucepan and cover with cold water. 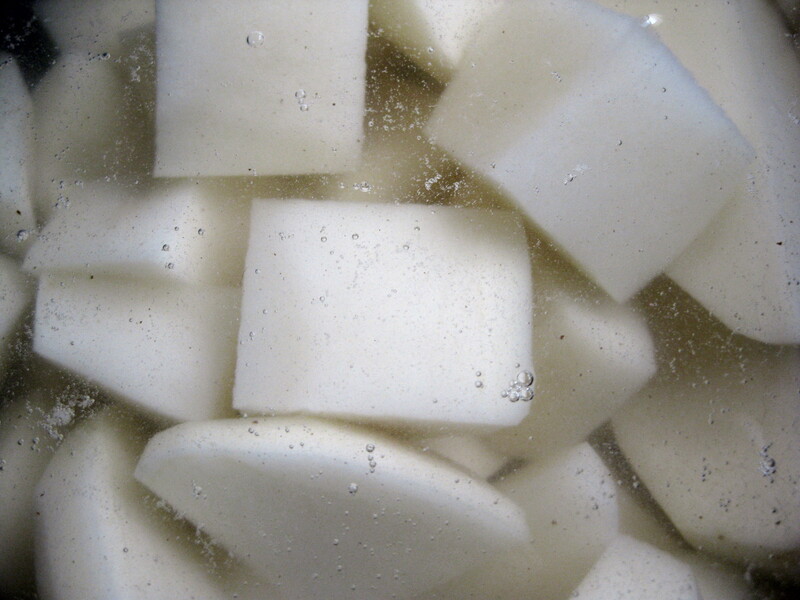 Bring the water to a boil, cover, and cook for 15-20 minutes or until the potatoes are very tender. Drain well. 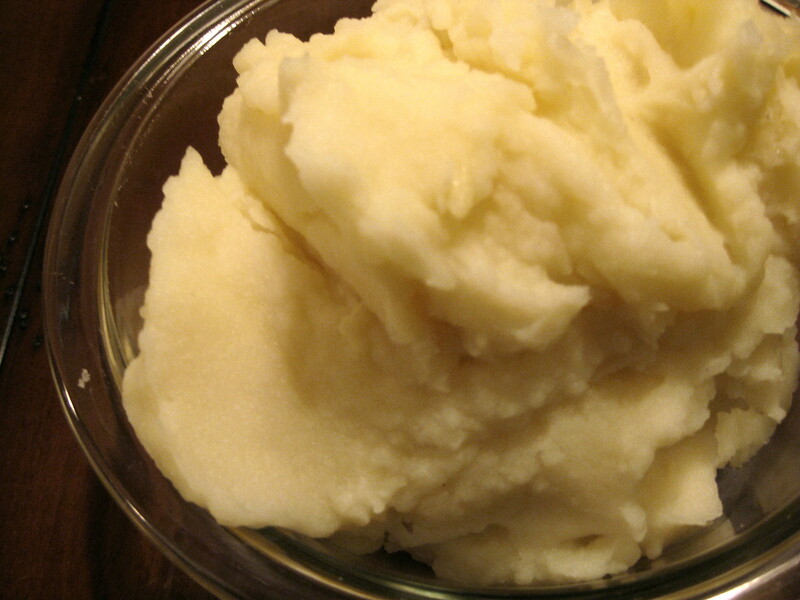 Pass the potatoes through a food mill or mash until they’re light and fluffy. Heat the milk and butter/margarine in the microwave for about a minute and gently fold into the mashed potatoes with the salts. In a small saucepan, heat the chicken stock with the chicken bouillon. Cut a large strip of rind from the lemon and add it to the stock. Preheat the oven to 400°. Add the canola oil to a saucepan over medium heat. Sauté the onions until translucent, about 10 minutes. Add the flour and cook, stirring, one minute more. Remove the lemon rind from the chicken stock and whisk the stock into the onions. Whisk in the milk. Lower the heat and simmer for 10 minutes, stirring often. 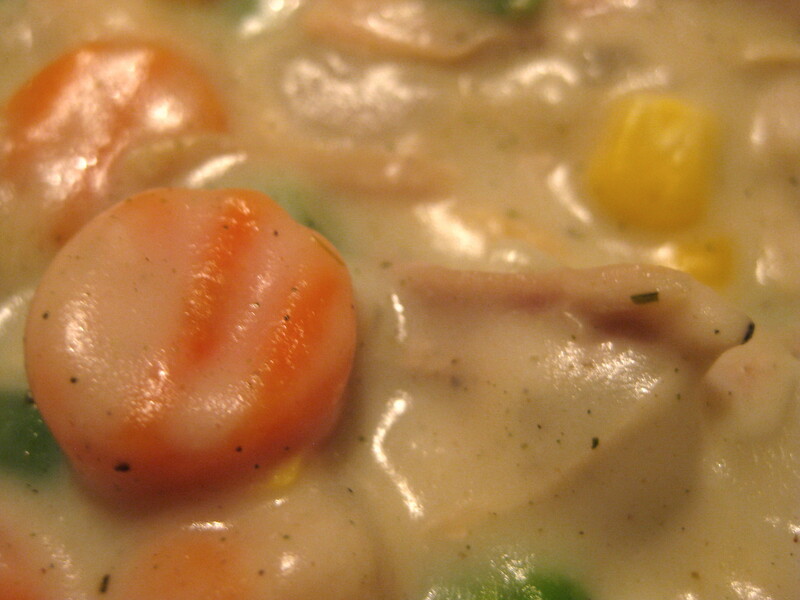 Add the chicken meat, poultry seasoning, mixed vegetables, and salt to taste. Stir well. Taste and adjust seasoning if necessary. Pour the filling into a 9 x 9 square stoneware pan. 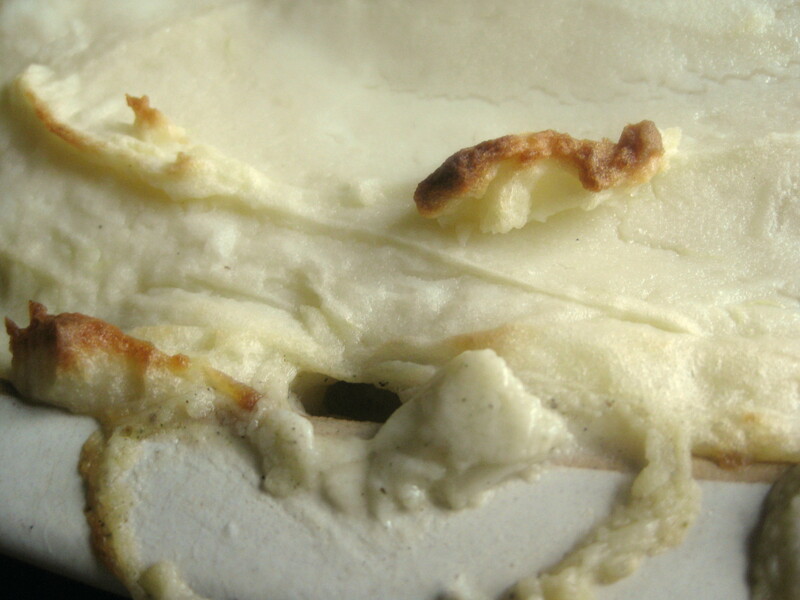 Top with mashed potatoes and bake for 25 minutes.